How product operators can be extended to describe experiments in AX2 and AX3 spin systems, thus making it possible to discuss the important APT, INEPT and DEPT experiments often used in carbon-13 NMR. Spin system analysis i.e. how shifts and couplings can be extracted from strongly-coupled (second-order) spectra. How the presence of chemically equivalent spins leads to spectral features which are somewhat unusual and possibly misleading, even at high magnetic fields. A discussion of chemical exchange effects has been introduced in order to help with the explanation of transverse relaxation. The double-quantum spectroscopy of a three-spin system is now considered in more detail. Dr James Keeler is a Senior Lecturer in Chemistry at the University of Cambridge, and a Fellow of Selwyn College. In addition to being actively involved in the development of new NMR techniques, he is also responsible for the undergraduate chemistry course, and is Editor-In-chief of Magnetic Resonance in Chemistry. 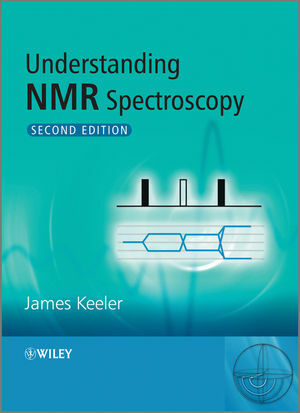 Dr Keeler is well-known for his clear and accessible exposition of NMR spectroscopy. Addition of a short chapter on classic spin-system analysis. This topic has become rather unfashionable (having been the mainstay of classic NMR texts in the sixties and seventies), but nevertheless remains important. Remains the only book which sets out the theory of NMR in an accessible and comprehensible manner, avoiding excessive mathematics and taking the reader step by step though the argument. Addition of interactive web-based resources for the book which go beyond simply reproducing the figures. Each chapter with tested exercises. Incorporating feedback from course participants and internet users.